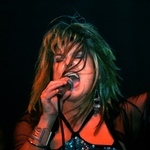 Sign up for Broadjam today to follow Michele Lundeen, and be notified when they upload new stuff or update their news! Long awaited, passionate and powerful rockin' and funky blues debut from award winning artist Michele Lundeen. Co-Produced by Johnny "V" Vernazza (Gold record winning Elvin Bishop alumni) with a smokin' backline a a duet with slide guitar master Roy Rogers. Sassy and intense vocals are highlighted on this 12 track feast of bluesy-based tunes (including 9 self-penned orignals) ...old-school R&B, funk, scorching ballads, swamp voodoo, Delta porch blues, roadhouse rock, gospel drenched soul, campy jazz-blues, East Bay grease and wry humor. Everyone has "song" inside to "sing" out. Don't wait to long to share your song and don't let anyone or anything discourage you from letting your feelings out. I have been performing music live for many years and finally recorded my debut CD. I know I have been worried I may not get it just it "right" but I finally got the courage to just step up to the plate in the studio and share mypassion and power. The words came together when I realized how much time I've let go by. I owe this accomplishment to myself and those that know and love me at the very least. No matter the trials and tribulations that come with life, do the best that you can and always remember to laugh and be honest with yourself. My oarents divorced when I was very young and my mom raised my sister and I pretty much on her own. Times were tough and when I got a little older I rebelled. I made my own tough times but through it all I keep my sense of humor and the values my mom instilled in me. Be true to yourself and don't live a lie....and always remember to let things roll off your back. I love to laugh! Girl gets swept up by charming guy who turns out to be a womanizing thief. Girl ends up leaving without her money and her honey. I love campy jazzy swing with a trombone and I dig how this song came together... it was fun. The term "No Money No Honey" rolled off my tongue one day and developed into a kicked-back simple story of being blinded in "love with a cheating loser. My favorite line is "if I want abuse, I'll get a cat." I love cats but we all know how arrogant and aloof they can be. When I thought that he was workin? hard. Sometimes relationship grow stale and at some point it's just time to move on even if it's so hard. The conviction of that ultimate decision is all powerful. I was in a relationship that I realized was not going any further than it had. I've always been a dreamer and like most of us I guess, ignore all the signs until I can't stand it anymore. One night while alone in the house I thought why should I wait, worry, wonder... I'd rather just be alone than be lonely here anticipating. I then realized how unhappy and "stalled" I had become and that is was time to start all over into a new life phase.... ah, once again!